Quick-Step's Fernando Gaviria has won the third stage of the Tour of Guangxi, as such taking the third consecutive stage in the last WorldTour race of the year. The stage was 125.4 kilometres long from and to Nanning and had more movement than the two previous stages, despite also finishing in a bunch sprint. The escape of the day was formed early on the stage. Daniel Oss (BMC), Nuno Bico (Movistar) and Jack Haig (Orica-Scott) went ahead for most of the stage but were caught with 50 kilometres to go. This was followed by everal attacks and Cannondale-Drapac's Lawson Craddock and UAE Team Emirates Matej Mohoric managed to break free from the pack but were caught at five kilometres from the finish line, sentencing the stage to a final bunch sprint. 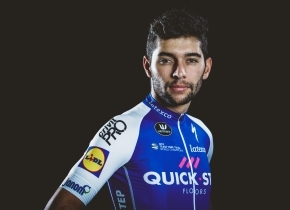 Gaviria showed once again to have the better legs at the last meters and crossed the finish line just ahead of Max Walscheid (Sunweb) and Magnus Cort Nielsen (Orica-Scott). Niccolo Bonifazio (Bahrain-Merida) and Wouter Wippert (Cannondale-Drapac) completed the top five of the day. The Colombian keeps leading the GC ahead of the Queen Stage of the Chinese race.